Six years ago the present prosperous town of Silverton was a mere hamlet, enjoying but little trade, and classed among the insignificant points of the State. Today the population of the town is no less than 900, it has the air and bustle of a trading and banking center of prominence, and Silverton is now ranked among the most progressive towns of Western Oregon. Silverton was incorporated in 1885. Soon after the act of incorporation was passed, the spirit of progress and enterprise pervaded the community, and this progressive spirit on the part of the inhabitants has resulted in building up at this point a wide-awake little city that is a model of cleanliness and beauty. During the past few years Silverton has continued to make substantial and steady growth, nor has this increase in population and wealth yet subsided. On the sides of the gently sloping hills which have the appearance of surrounding the city, are situated many handsome residences, some of which are almost palatial in the handsome appearance of their superstructure, while the majority of the private dwellings of the residence district are good. New buildings are being erected in different parts of the city, and the vacant lots within the corporate limits are rapidly being occupied by a good class of houses. The main business thoroughfare of Silverton, during the working days of the week, has a decided metropolitan appearance. Imposing blocks, constructed of brick manufactured from clay found in inexhaustible quantities in the immediate vicinity of the city, stand on the prominent corners of the business street. 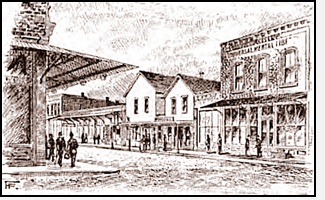 A number of very fine business blocks have been erected here during the year, and other equally as substantial structures are already planned and will be built during 1894. Silverton occupies a site in one of the most productive portions of Marion county. It is 45 miles south of Portland and 14 miles east of the state capital at Salem. It is reached by the Woodburn Springfield branch of the Southern Pacific system, the branch connecting with the main line at Woodburn, 10 miles distant. An efficient train service has been established by the Southern Pacific company, which gives Silverton the advantage of two trains each way daily between this point and Portland. One of these trains runs north and south between the junction with the main line at Woodburn (through Silverton) and Natron, 93 miles south of Woodburn, and the other train makes a daily round.trip between Woodburn and Silverton, making close connection at the former place with the trains on the main line. Silverton thus enjoys the best of advantages for reaching all parts of the Willamette valley, and this efficient train service, both north and south, has done much to encourage the growth of the city. In addition to the advantages of rail connection, Silverton also supports a stage line which makes daily connection with Salem. It has been the aim of the railroad company to extend every advantage to the merchants of Silverton in the way of transportation facilities. A side-track extends from the main line of the railroad at this point along the principal street to the flouring mills of the Oregon Milling Company. These mills are among the largest in the state. The capacity of the plant is 300 barrels of flour a day. The total output of these mills, for 1892, which was considered a short season, was 42,000 barrels. The celebrated brands of flour, "Royal" and "Pioneer," manufactured by this company, are among the best known brands of the coast, and great quantities of this flour are now regularly shipped to all parts of the world. Silverton boasts of an excellent water power, obtained by means of a short canal from Silver creek, which flows by the edge of the town. This power is more than sufficient for operating the large flouring mills here. and it also runs the local sawmill, sash and door factory, and an efficient arc and incandescent electric light plant. During the past year a most complete system of water works has been completed at Silverton. The water for domestic use in the city is pumped from the river direct into a large reservoir which is sufficiently elevated to afford ample pressure. Water mains are now lain along all the principal streets. The pressure in the city's mains, together with an efficient volunteer fire department which is maintained here, affords perfect protection against disastrous holocausts, and there is no danger of the place succumbing to the ravages of the fiery element. Both the electric light and the water-works plants are owned by private individuals. In addition to the manufacturing plants of Silverton enumerated above, are two very important brick-making plants. All the brick used in the construction of the fine business blocks of the city were manufactured in the local yards, and in addition to the heavy local demand, these yards regularly ship large quantities of their product to neighboring points in the valley. The finest brick block in Silverton, at the present writing, is that of Messrs. Adolf Wolf & Son, an illustration of which is published in connection with the present article. This building was erected two years ago, at a cost of $10.000. The first floor is used as a general merchandise store, while the second floor is devoted to office purposes. The basement has a cement floor.and is used principally for storage purposes. In the basement is located the furnace which supplies the heat for the entire building. Mr. Adolf Wolf and his son, Mr. J. C. Wolf. have now been in business in Silverton for 10 years past. This firm conducts, at Silverton, one of the best-appointed general merchandise stores in the state, and they carry constantly a stock valued at from $25,000 to $30,000. 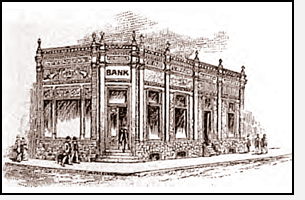 The banking house of Messrs. Coolidge & McClaine, as shown by the accompanying illustration, is a handsome brick structure, which was erected during the past summer. The bank itself is one of the solid financial institutions of the Willamette valley. It has a capital stock of $25,000, and a surplus of equal amount. Its officers are Alfred Coolidge, president; Fielding McClaine, vice-president, and M. J. Adams, cashier. 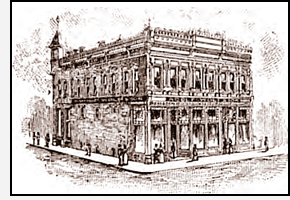 The firm of Cusiter & Davenport also does a large general merchandise business at Silverton. Mr. George Cusiter, whose portrait is published in connection with the present article (right), furnishes a typical example of the possibilities that await the young man of push and enterprise in the Western country. Mr. Cusiter is but 31 years of age, but he is now ranked among the most successful business men of the Willamette valley, and he has attained the highest gift within the reach of the people of his adopted city, that of mayor of Silverton. Mr. Cusiter makes a very efficient executive office and he enjoys the confidence of the en­tire community. AIl the various business pursuits and professions are well represented at Silverton, and the volume of business annually transacted here is large and is constantly increasing. 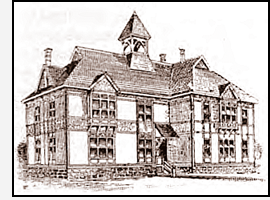 Silverton ranks high in the matter of educational advantages afforded its youth.The fine city public school is a pretentious and handsome piece of architecture, as shown by the illustration accompanying this article. It contains six rooms and its erection involved an outlay of $7,000. The building occupies a full block of ground in the central part of the city and is perfect in all its appointments. The grades of the public schools are well defined and the public school system is ably managed. Five experienced teachers are employed in the public schools here and the daily enrollment of scholars in attendance during the past year reached 225. But three church organizations are maintained in Silverton. These including the Presbyterian, Methodist and Christian denominations. Each of these organizations owns its own church building, and each is strong in membership. The Tribune, a weekly paper, is published at Silverton, and it is well supported. A good hall with a seating capacity of 30, affords a convenient place here for public entertainments. Good accommodations are afforded the traveling public in three well conducted hotels. The Silverton livery stable, of which J. H. Moser is proprietor, is well equipped with horses and vehicles. Mr. Moser pays special attention to meeting the demands of the traveling public for riding and driving, and he has some of the best stock in the country. In addition to the establishment presided over by Mr. Moser, Silverton also supports another stable. Silverton's main source of support is the exceptionally fertile and highly productive farming section immediately tributary. While the soil of this land is especially adapted to the raising of fruit, including prunes and strawberries particularly, hop culture and the raising of grain claim a large part of the attention of the farm­errs of this part of the stale. Dairying and stock raising here have also proved most remunerative callings. Considering the proximity of Silverton to Portland, and the exceptional facilities for shipping enjoyed by the farmers here, land in the vicinity of Silverton is not held at high valuations. From Mr. G. A. Webb. a reliable real estate agent, who has resided at Silverton for eight years past, it is learned that the price of improved land three to six miles distant from the city, today vary from $20 to $50 an acre. Within one mile of the corporate limits of the city choice lands can be bought for from $40 to to $65 an acre. Mr. Webb is ready at all times to furnish reliable information, either of Silverton or of the rich section of country tributary. Silverton is a thriving place, made up of an enterprising population. The people here are at all times alive to the advantages of location which the city enjoys, and they are disposed to make the best of the opportunities afforded them here for advancement. The people of Silverton have strong hopes of making their town one of the principal commercial centers of the Willamette valley, and the advancement the place has made during the past few years augurs much for a continued growth in population and wealth in the future. From "The Oregonian's Handbook of the Pacific Northwest." By The Oregonian Publishing Company, 1894.